As it grows cooler out, I like my food cooked. Salads and brown bag lunches are for the hot months of summer. When I’m driving home from work and it’s already dark, I’m craving soup, stew, big ol’ bowls of noodles. Combining my love for comfort food with my need to not gain 20 pounds in the next four months is an amazing feat. Meet kale. Yeah, I thought it was gross, tough and bitter two weeks ago. But I have learned my lesson! I love kale now. I now am the proud owner of an industrial sized bag. Because if the world ends and I am trapped in my basement hiding from the zombie appocolypse, I will need my dark green veggies. 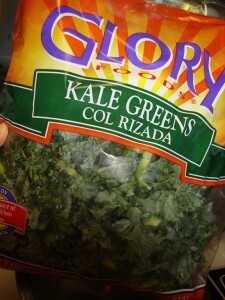 That and kale cooks down, a lot Here’s the secret to kale love. I learned this at a dinner party from a chef in Brookyln. Honey, if you are wondering, is the secret ingrediant here. 1. Heat olive oil in a frying pan. Actually, I like to cook this in my wok so I can make bigger batches. 2. Add chopped garlic and a shake or two of red pepper flakes. Saute. 4. Make sure the pan is really hot. Put handful of kale in pan, and pour about 1/4 of a cup of chicken broth over the kale. The broth should steam immediately upon hitting the hot pan. When the kale start to wilt, add more kale and chicken broth as needed. When you have the desired amount, cook for 3-5 minutes.